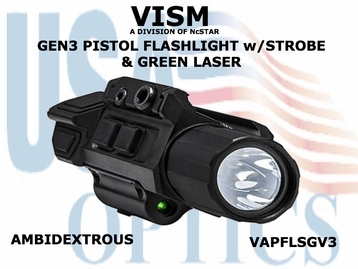 This new pistol flashlight and laser from VISM* features a new easy access push button switch on both sides, allowing for left or right handed shooters to easily access the many features of this combo. The light offers a 150 Lumen CREE LED flashlight with strobe, as well as a fully adjustable green laser. This combo features a standard Picatinny mount, however it may require some modifications to fit on to certain guns.